African Wildlife Foundation’s canine detection units are making it harder for poachers to profit off elephants and rhinos. They are specially trained to sniff out elephant ivory and rhino horn in Africa’s major airports and seaports. I like that it’s one area where dog’s hunting skills can be used to help wildlife and this kind of work is generally fun for them. Click the link below to meet the first graduating class. Queen Elizabeth achieves another milestone as she becomes Britain’s first sovereign to celebrate her 90th birthday. Happy Birthday, your Majesty! There are some great pictures in the link above, click the source article to see them all but I really enjoyed this one of Her Majesty with four of her dogs best. These are Willow, Vulcan, Candy and Holly at the rear of the East Terrace and East Garden in the private grounds of Windsor Castle. This article linked below is from a couple of years ago specifically about the corgis. Holly and Willow were 12 at the time of the Vanity Fair article, that makes them really old ladies now. When we had Geoff the puppy living with us Rob very patiently taught him how to use the dog door. He jumped in and out a few times and then poked a toy through the hole from outside. After Rob waggled it to get his attention, he’d pull it through, as if to say, “come on, Mr. toy can make through the door and so can you.” It was so cute! This was repeated until Geoff finally stuck his head through on his own but he wasn’t too sure about pushing out through the flap. Our dog door is installed kind of high since it was originally placed for Freya who was a tall German Shepherd and the pup’s legs weren’t that long but Rob barked and ran in circles until Geoff just couldn’t stand it anymore and finally jumped the rest of the way through. 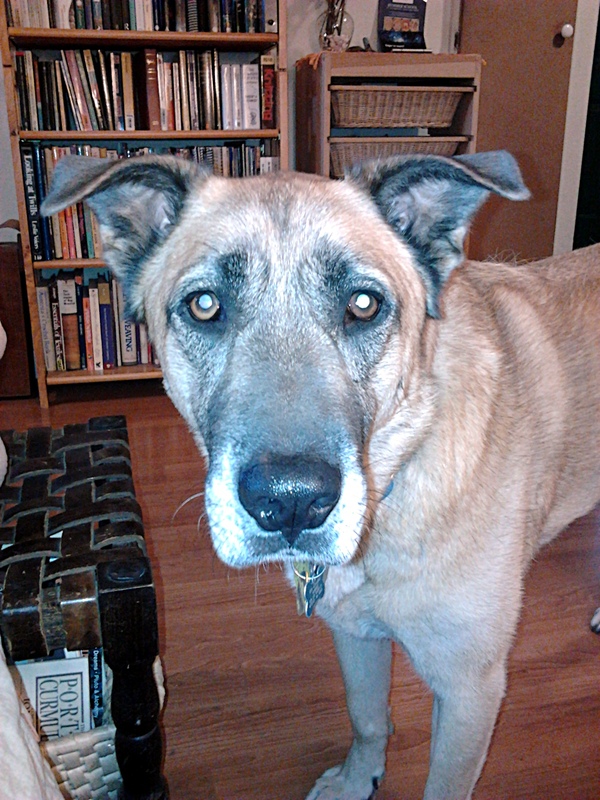 Soon he was flying through the dog door as if he’d been doing it forever. No it is not a shark. It is a dog, a pet dog, in fact, diving for a tennis ball. See the ball? Click the link to see more in the series, they are all pretty freaky… and toothy! 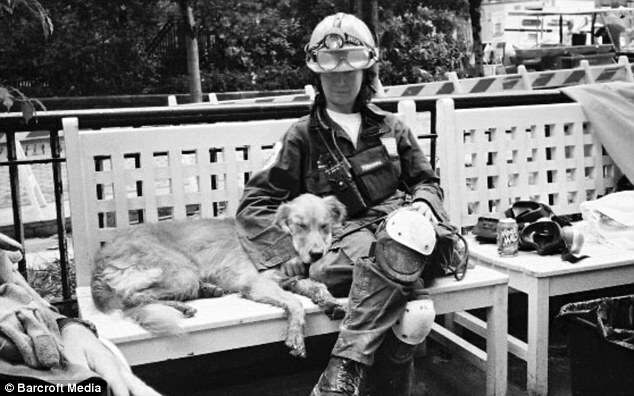 100 rescue dogs searched the rubble of the World Trade Center for survivors and then for remains during the weeks after the plane attacks on September 11th, 2001. 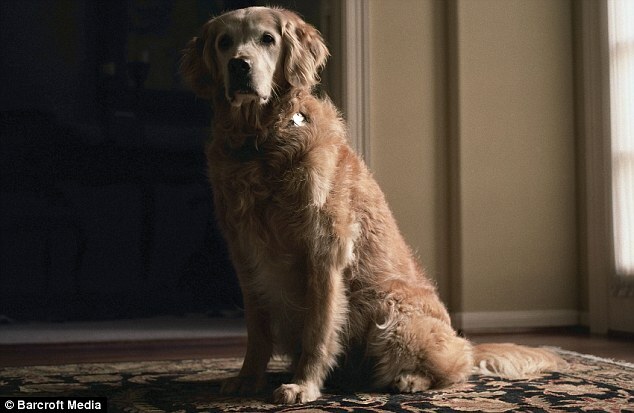 I spotted an interview in The Daily Mail with Dutch photographer Charlotte Dumas about her book which “captured the remaining dogs in their twilight years in their homes where they still live with their handlers, a full decade on from 9/11.” The portraits are sweet, like the one above, of the dogs at home juxtaposed with pictures of the horrible event that brought them all together and stories about their encounters with survivors and with other rescue workers. I am so glad she did this now because they are a rapidly vanishing resource. When Dumas began travelling the US to take these portraits fifteen of the dogs were still alive, only thirteen are still with us.